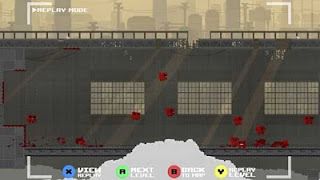 I have been banging my head against the wall known as Super Meat Boy. It is a slow, persistent, and surprisingly enjoyable bludgeoning. This should not come as a surprise to any of you. 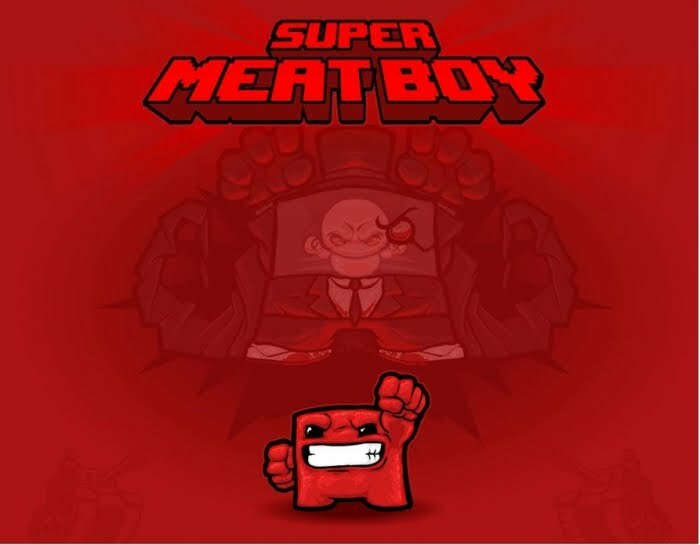 Super Meat Boy has appeared on numerous ‘Best Games of 2010’ lists, charming the socks off of even the most timid gamers. Of course not everyone appreciates the severe psychological trauma induced by the speeding chunk of meat. Considering my own aversion to masochism, I am surprised I have taken to the game so well. The adrenaline boost from overcoming a level after dying over and over and over again is exhilarating. What find most interesting, however, is how it allows me to peek into the chaos of a gaming failures. The best thing about the replay feature is that it allows me to peak into the past. I don’t take just one path to the end, but many. Each and every meat boy symbolizes precious seconds I spent trying to achieve some outcome, not all of which are completing the level. Why did I jump to the left last time? Why did I hesitate at the wrong time? Why did I spend so much damn time trying to get that bandage when I was clearly approaching the task incorrectly? Watching those Meat Boy replays is like looking through a window into the past. It shows me the many mistakes and assumptions I made, captures all the time spent playing the game that doesn’t quite fit into the final story. What would this replay feature look like in other games? Maybe when leaping across a gap in Mirror’s Edge, a ghostly version of Faith would jump by my side, plummeting to her death while I barely grab the ledge. Maybe the streets of Cuba in Black Ops would be crowded with the flickering corpses of versions of me. It actually sounds quite unsettling. Of course in these cases, the replay would function differently. They would occupy the play space while I was still engaged within it. Replays might reveal dangerous areas, acting as a sort of heat-map depicting fatal mistakes. It would be educational, something Meat Boy’s replays are not, at least not in the classical sense. When hunting through the crowded streets of Rome in Assassin’s Creed: Brotherhood multiplayer, accidentally killing a civilian is bound to happen. When it does, a marker will inform you of the whereabouts of the target you should have killed. It is difficult to pinpoint the moment of your mistake, so showing who you should have killed acts as more of a taunt than a history lesson. Meat Boy’s replay acts similarly. The levels are short enough, and its hazards very apparent, that the dozens of doomed characters rub the past in my face. Given, there are some players who will analyze their failures for minute changes they could make on their next attempt. Personally, my screen is too full of hopping red botches to accurately assess my mistakes. Instead, replays map my gaming past, one that generally remains hidden in most games, obliterated by the newest save file. 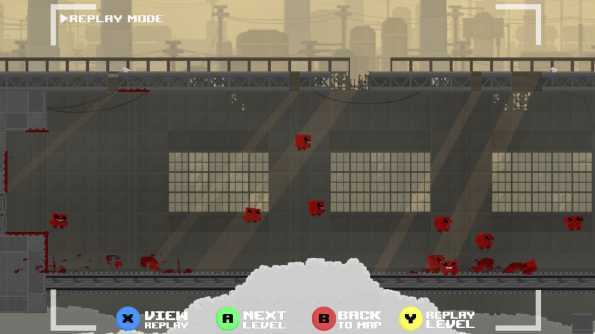 Completing a level of Super Meat Boy is like becoming, for a moment, my own anthropologist. I enjoy the sensation, even though its the only benefit I get from reviewing my personal history. "Replays might reveal dangerous areas, acting as a sort of heat-map depicting fatal mistakes." Since you didn't mention it: That describes about exactly what "Demon's Souls" achieves with its blood splatters. Of course, there's the crucial difference that they do not show the last seconds of your failed attempts, but the ones of other players. And it's actively witholding information, since you do only see the player's actions in those moments, but not any possible foes that killed them. Still, as a player, you learn a lot from observing the ghostly apparation of other players' last seconds of life, and it definitely changes the way you approach the next challenge. You are, in a way, an anthropologist (or archeologist) of other people's failure and hybris - something that ties in very well with the game's theme of a former glorious kingdom succumbed to delusions of grandeur. Hi EXP! I just want to say that I really enjoy your podcasts and writing! I am unsure how popular your site is, but my feeling is that due to the default Blogger theme a lot of potential readers/listeners are "scared away", which is a shame. May I suggest that you pick a more stand-out theme, either in Blogger og WordPress? 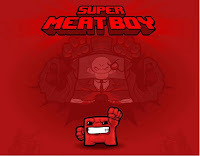 I have only played the Flash game Meat Boy, not the updated version. As you point out, games like this—Trials HD also comes to mind—are fun in large part because they continually challenge the player at a level just beyond her current ability, and immediately reward improvement (while punishing failure only minimally if at all). In educational theory, this kind of design is known as "scaffolding" (or more technically, the "zone of proximal development"). Games are very good at allowing players to overcome failure. I don't know if this is a transferable skill—that is, whether learning to be OK with failure in a low-stakes virtual environment also teaches players to be OK with trying and failing at tasks with greater repercussions. It would be nice if it did. Regardless, educators are starting to take notice of the ways that games encourage this kind of determined, engaged behavior. Demon Souls! I knew I forgot to mention something. I love how that allows a form of communication across time, in its case with other players. Interestingly, you can learn the wrong thing from blood spatters, right? When playing it, do you feel like a detective at all? Speaking of multiplayer communication, this also makes me excited for Journey from ThatGameCompany. Yes, I absolutely love the idea of educational games and game design. I'm curious to know if Meat Boy breaks any rules of educational theory while still being fun though. Sometimes I make it a very long way, then die again early in the level, repeatedly. Also, the lessons learned from one map don't necessarily apply to the next. Meat Boy really pisses me off sometime, but still brings me back. I think some high school classes are similar. "Personally, my screen is too full of hopping red botches to accurately assess my mistakes." I think you nailed what makes the replays in SMB distinct. Lots of games try and teach you from your mistakes (see DeathCams in online shooters), and we've had games with "ghosts" before, but SMB goes one step further and looks at ghosts not as teaching tools, but as a conclusion to the level. It's almost as if, on a really difficult level, it's not quite over until you watch your replay. Good post, and glad you enjoyed mine. I wonder if there is a way to somehow capture and upload replays from various players. While a single replay might look like chaos, I have a hunch that a wide-ranging comparison might be interesint. For example, you could see whether you're more prone to jumping, running, sliding, etc., compared to other players. I got a taste of this while playing New Super Mario Bros. Wii with four people. Everyone moves slightly differently, even though the controls are the same. I've always wished for this kind of macro-level behavioral analysis in games.